Apple introduced the first-generation iPod on October 23, 2001, with the slogan "1,000 songs in your pocket". The first iPod had a black and white LCD (liquid-crystal display) screen and featured a 5 GB hard drive capable of storing 1,000 songs encoded using MP3 and was priced at US$399. 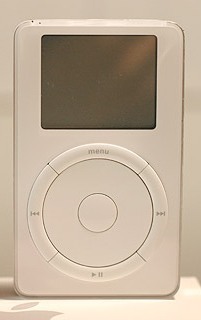 Among the iPod's innovations were its small size, achieved using a 1.8" hard drive, whereas its competitors were using 2.5" hard drives at the time, and its easy-to-use navigation, which was controlled using a mechanical scroll wheel (unlike later iPods, which had touch-sensitive scroll wheels), a center select button, and 4 auxiliary buttons around the wheel. The iPod had a rated battery life of 10 hours. On March 20, 2002, Apple introduced a 10 GB model of the first generation iPod for US$499. vCard compatibility was added, as well, allowing iPods to display business card information synced from a Mac. The finished iPods used 5 GB Toshiba hard drives that were the size of a quarter, ARM processors (the same processors used in the Newton and Acorn), an operating system from Pixo, a large high resolution display, a lithium polymer battery, and the most recognizable aesthetic feature of the device - the scroll wheel.